Tulip is a special spring bulb, beautiful in appearance and elegant in exposure. It consists of more than 3000 varieties of species. It has a huge family of plants. It comes in various colors such as red, yellow, cream, maroon, white, pink, salmon, purple, black and apricot. It comes in various shapes too such as lily shaped, double or ruffled fringes…It is originally from Persia and Turkey. It is found in Northern Africa and Southern Europe, western China and Iran. Here are some of the countries where this plant is found: Greece, Iberian Peninsula, Turkey, Lebanon, Jordon, Mongolia,Iran,China etc. Description: Tulip belongs to the Eurasian and North African genus of the perennial plant with bulbous origin belonging to the lily family and blooms mainly in the spring season. This herbaceous plant has known species of around 75 in number although there are a lot variety of other species. Most of the smaller tulips are perennial but the larger growing tulips are not perennial for they often require re-plantation. They come in different height, some of the tulips are as small as 6 inches while the other species of tulips are about 2 feet tall. Tulips require an environment that is cool. They grow best in cold winters, cool summers and cool springs. They are one of the flowers that appear first during the spring months and can last till the late summer as well. If you a good lover of tulips plant, the best site selection is to choose a place that receives full sunlight to light shade keeping in mind that the soil is well drained. Flower: Tulip is a beautiful flower, elegant and graceful. The bloom appears in various colors such as red, yellow, pink, purple, maroon, black… The bloom is star shaped and has three petals, three sepals and six tepals. Most of the stem produce only one flower at a time but some bigger tulips give rise to multiple flowers tool. Leaves: The tulip stem give rise to few leaves. Larger specie of the tulip does give rise to more number of leaves. The minimum number of leave is 2 to six and the maximum number of leaves is 12. The leaves and the stem often appear in bluish green in color with waxy coating. Care: It is not difficult to take care of the tulip plant. The planter needs to make sure to keep the plant well-watered during the dry fall months. Once the plant has fully grown and starts to wither back, it is good to cut the worn out flower stalks and let the leaves fall out on their own. It is good to provide annual compost manure to this plant for an abundant and healthy yield. In case the plant is tall and large in appearance, it is good that you replant it when you see the area of the growing plant congested. 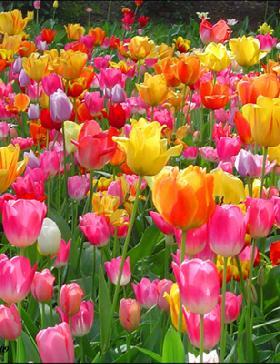 Planting: You are suggested to plant the tulip bulbs in the fall as early as eight weeks before the hard winter frost. The right time to plant these bulbs is in the month of September and October. When you are in the process of planting the bulbs- here are few things to keep in mind: add compost manure to the loosened soil and dig hole that is around three times the height of the plant, keep a space of 4 to 6 inches apart. You are also suggested to water the plant thoroughly after the plantation. Also make sure to protect your plant from harmful agents such as mice, insects etc. Symbolical meaning: Tulip comes in a big variety of color and each color has its own symbolical meaning. It is mostly regarded as the symbol of fame, true love, friendship, relationship etc. During the 13th century Persia, the tulips were taken as a symbol of inspiration for the poets. Below are some of the colored tulips with their true symbolical meaning. Uses: Tulip flower has a great lot of uses mainly due to its uniquely elegant appearance. This flower is mainly used during the wedding hours to provide a bouquet for the marrying couples. It is also used as a surprise gift for a loved one: for father’s day, mother’s day, friendship day, valentines day etc. It serves as a good table decoration. It looks wonderful when planted as a garden flower. Besides the natural beauty that tulips add to our garden, the tulip plant has huge commercial uses too. There are tulip industry in the European countries.The dry powder formed from the tulip bulbs can well be used in adding extra flavor to the flour or other forms of cereal products. It is also used in making natural colors. One of the other speciality of the tulip is that it is edible, it serves as an onion substitute. The flower is also edible, thus, it can be added to add an extra beauty to the salad. The tulip flower has cosmetic uses. The tulip has widely been used in the beauty products. It is a very good remedy for the dry and sensitive skin. Tulip is used in the manufacturing of essential oils, creams and lotions. More importantly, the tulip is also used in perfumes. Tulip has some health benefits too: it has long been used for the remedy of cough and cold. It cures hay fever, sinus pain and also to cure headache. It has anti-septic properties. Habitat: Tulip plant prefer cool environment for the maximum healthy growth. This plant blossoms in cool spring, dry and cool summers and also during the cool autumn months. They grow well in the mountainous regions of Turkey, Persia, China, Iran, North Africa etc. Propagation: It is possible to propagate the tulip plant in a lot of different ways. One can propagate this plant bulb through the offsets, tissue culture, micropropagation via seeds. The cultivars use seed in order to propagate a hybrid. Offsets and tissue culture helps in asexual propagation.